We had a few days in Amsterdam to holiday, ride bikes and enjoy the city. I knew we’d swing by a few of the espresso bars (being careful with what to call them (in Amsterdam Cafes are generally bars and Coffeehouses are something else entirely)). 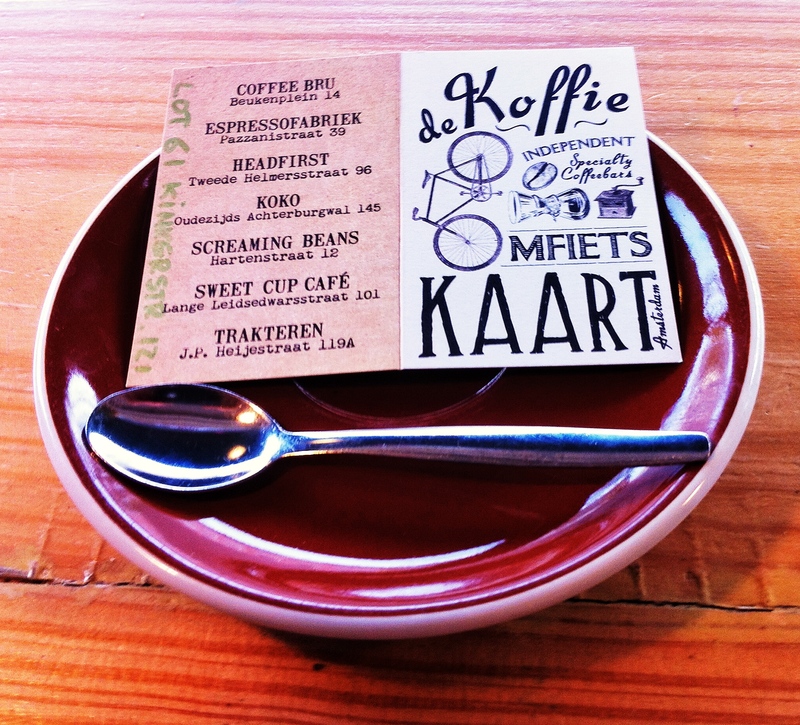 I came to Amsterdam with few preconceptions about coffee and came away impressed. It’s a small city and the scene is growing and at the same time long standing – Espresso Fabriek was founded in 2005. We rented bikes at Amstel station (8.50E a day!) and headed North-East to Coffee Bru near the Oosterpark. Coffee Bru was a great first stop, a warm, welcoming community cafe with a relaxed atmosphere. The decor is arty and interesting and the espresso and filters are on the menu – the main roaster used is Bocca but a variety of guest roasters also feature. We had a slice of red velvet cake with edible eyeball (hey, it was October 31st) and a couple of flat whites. The texture was good, a medium dark Brazilian espresso hit the spot (can’t remember the name of the local roaster). We had a good chat with the friendly staff and moved on, not before we were handed the newly printed Amsterdam coffee disloyalty card and pointed also to the Scandinavian Embassy and Lot 61, both too new for the map. We heard rumours of a second Coffee Bru cafe soon. Finally we headed to the Eye Museum for lunch but that’s another story. Scandinavian Embassy near Sarphati Park, opened in October. It is attractively constructed in pine with seating at the bar where you can engage with barista Nicholas and chef Rikard (I only briefly saw Dominika) and fuss over the cute dog. Coffees are from a rotation of Scandinavian roasters. Coffee excellence is emphasised with a range of filter and espresso options. Coffee Collective from Denmark were the featured roaster at the time of my visit and Koppi and others are planned for soon. I chose a Yukro and enjoyed the flavours at length – a truly excellent pourover! I tasted a fruity peachlike sweetness and acidity with the lavender and cardamon described in the tasting notes. I made the mistake of reading the notes first (then you’re never sure what is autosuggestion but it was certainly a complex and lovely coffee. The menu is seasonal and sustainable, Rikard was cooking for an eveving private meal and gave us moose and bear to try! Coffee tasting sessions and coffee food pairing courses are planned. Although they plan a move soon, Headfirst are currently located inside a rather stunning design/lifestyle store Harvest & Co. This does make for quite a setting for coffee and we did enjoy our stay, chatting with the baristas and reading the latest magazines. This area to the West of Vondel Park is home to the densest concentration of coffee places: here, Screaming Beans’ new place, Lot 61 and Trakteren and not too far away Sweet Cup, but then in Amsterdam nothing is far away. It seems a fairly affluent area with a large number of great artisan shops – we also enjoyed chocolates, herrings, baked goods and shoe shops in this area. I had an enjoyable single origin espresso (in a large cup as seems standard for a double espresso here). It does thin the crema and make for a different drinking experience. For the life of me I can’t remember what it was …. a fairly unmemorable coffee I guess but I remember it as a a very decent roast well poured. I think something Central American. I skipped the new Screaming Beans practically next door as it looked too much like a rather sterile wine bar – but appearances can be very deceptive so I plan to go there on my next visit. A hop, skip and a jump away, this place was stunning, a smallish cafe, decked out with beautiful wooden panelling opened out to stairs to a room below, complete with roaster. Barista Florian (and a friendly fellow customer) kept me thoroughly entertained and regailed. I tried an Ethiopian filter that was elegant and peachy, and Ethiopian and Guatemalan single origin espressos. All were very good, I loved the Guatemalan. The pictures I took raised some interest on Instagram and a lot of people have been asking me about the place. I thoroughly recommend it, Lot 61 opened about 6 months ago and is a great new addition to Amsterdam. Knowing that Espressofabriek opened in the late 1980s, paving the way for small independent speciality coffee places in Amsterdam, I wondered if this place might have rested on its laurels and not kept up with current coffee trends. I could not have been more wrong! The coffee at Espresso Fabriek was excellent. We had returned the rented bikes (8.50 euros a day!) and trekked West to the rather attractive cultural venue of the Westergasfabriek (home also to the North Sea Jazz Club), consuming some great fruit juices and wheatgrass shots from a rather stoned juice shop owner along the way. Oh yes, we also found the best herring at a stall on Haarlemerplein. Espressofabriek is a beautifully functional space in a Scandinavian design style (or at least it seemed that way to me). It was crowded but felt relaxed. The person serving didn’t know what a piccolo was. Luckily I saw ‘cortado’ on the menu – I should have asked for a four ounce! In the end the piccolo was more like a macchiato and tasted divine. The Huehuetenango Guatemalan single origin (roasted upstairs) was quite delicious – a special coffee. I enjoyed a double espresso too – delicious and balanced with a thick, lovely mouthfeel. The barista was friendly and I enjoyed talking coffee with him. He let me climb the ladder to the roastery above. I tried another tasty coffee but all I ad time for really was the Huehuetenango. I did buy a bag of an Ethiopian natural though, let’s see how I get on with that! In the seedier centre of the city lies a hidden jewel, Koko. The place is both an espresso bar and a fashion/design store. It was slightly dark – hence my even poorer than normal photography but somehow combined upmarket elegance with being inviting and comfortable – not easy. The place is fascinating to explore and the coffee was decent. The charming barista made me a single origin espresso roasted by Caffenation in Antwerp. It was a smooth, if darkish espresso with a sweet liquorice flavour. I’ll be back! and anywhere else that opens in the meantime! This entry was posted in coffee and tagged amsterdam, coffee, espresso, roaster. Bookmark the permalink. In London make sure to visit Kaffeine, Prufrock, Store Street Espresso but we have some other great places including stalls like Beanstalk. Also MacIntyre coffee will be an essential addition to the scene when it’s up and running! I look forward to Trakteren on my next visit! Thanks for your coffee insights, also for an ‘Amsterdammer’ there is still a lot to discover and explore! A suggestion to add to your wish list: The Coffee Virus, located on the other side of the IJ. So a picturesque ferry trip is required – but only a short one, because they are located directly opposite the Central Station in the old Shell laboratory, now a creative hub housing dozens of designers etc. called A-Lab. Enjoy! Thank you. I am glad you have some new places to visit. I look forward to trying The Coffee Virus on our next visit. We did take the ferry to the Eye museum and had a very good lunch there and explored a little so I think we were close.